The analysts of a recent business intelligence study by Transparency Market Research (TMR) has detected that the commercial refrigeration equipment market in the region of Latin America is consolidated in nature, with merely six companies accounting for about 92% of the total shares in 2016. The six companies, viz. Metalfrio Solutions, Illinois Tool Works, United Technologies Corp., Dover Corp., Daikin Industries Ltd., and Lennox International, are expected to maintain their stronghold over the competitive landscape in the near future too, while the competition among them will remain intense at the same time. 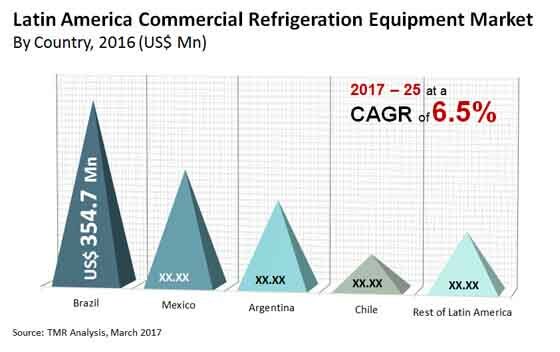 For these six market leaders in the Latin America commercial refrigeration equipment market, the emphasis is expected to remain on strengthening of their supply chain, particularly in the important countries of Mexico, Brazil, and Argentina. Development and launches of new products that meet diverse demands is another mode for the market leaders to gain ground over their competitors. If the projections of the TMR report are to be believed, during the forecast period of 2017 to 2025, the demand in the Latin America commercial refrigeration equipment market will increment at a notable CAGR of 6.50%. By the end of the forecast period, 2025, the analysts have estimated that the opportunities in the market will translate into a revenue of US$1,619.0 mn, considerably up from its evaluated worth of US$927.4 mn in 2016. As far as the new entrants are concerned, the entry barrier is expected to remain high in the near future and shares will remain distributed among the aforementioned six market leaders. Based on product type, the report segments the Latin America commercial refrigeration equipment market into refrigerator and freezer, transportation refrigeration equipment, commercial refrigeration equipment parts, and beverage refrigeration. In 2016, the refrigerator and freezer segment provided for 37.4% of the demand in 2016 and is anticipated to remain most prominent throughout the forecast period. Application-wise, the market has been bifurcated into food and beverage retail, food services, food and beverage production, and food and beverage distribution. On the basis of refrigerant type, the market has been classified into inorganic, fluorocarbon, and hydrocarbon or natural. Country-wise, Brazil has been highlighted as the most profitable nation for the vendors of this market to concentrate on, providing for 38% of the total demand in the Latin America commercial refrigeration equipment market in 2016. Changing food consumption pattern of urban populations across the emerging economies of Brazil, Argentina, and Mexico is the primary driver of the Latin America commercial refrigeration equipment market. The restless lifestyle that urban population are resorting to in order to gain disposable income is showing on increased consumption of packaged food that utilize refrigeration processes to maintain freshness and nutrition for longer durations. While the prosperity of the food and beverage industry is propelling the demand in the commercial refrigeration equipment market, development of diverse type of equipment that ideally meet different requirements is driving the adoption, despite the substantial cost of these products. In many cases, food and beverage companies provide these refrigeration equipment to retail shop vendors as the space occupied helps them as a mode of advertising and market of products right where the customer footfall is maximum. These advertising companies generate bulk demand. Mexico commercial refrigeration market, in particular, is foreseen for a healthy future on the back of incrementing demand for frozen and ready-to-eat food as well as the presence of a formidable food processing industry in the country.